But you can see that one sprint race that stands out among the rest. Indeed, that 6th place finish was her best WC result, and her only top 10. She had a total of 15 races where she landed in the top 30, across both disciplines. She was most definitely a freestyle specialist, having competed in only 3 WC classic events and another 2 mixed technique events (i.e. pursuits). All the rest were skating. 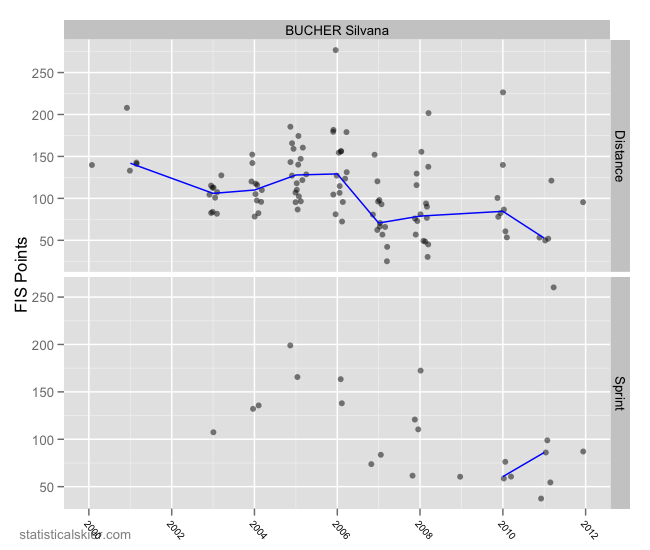 Steadily between 75-125 FIS points for several seasons in distance races, possibly even sliding backwards a little, and then there was a rather major jump in 2007. Then there’s the near total absence in 2009, which I’d have to guess is an injury (or sometimes with women it’s a baby). Her World Junior results were ok, but not great: 19th, 33rd, 46th, 51st. Interestingly, though, she scored a 1st and 5th at U23s in 2007. Posted by Joran on Friday, May 11, 2012, at 6:00 am. Filed under Career Retrospective, Cross Country. 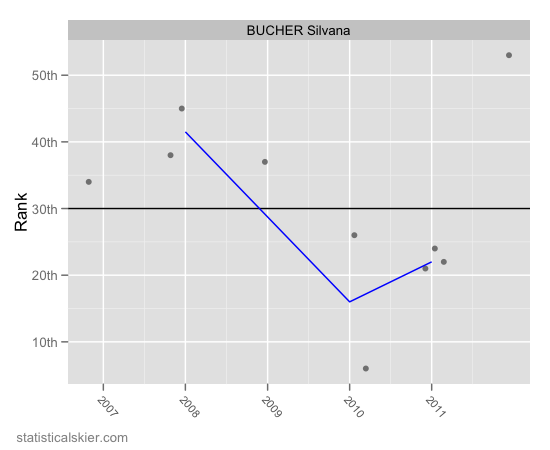 Tagged career retrospective, retirement, silvana bucher, swiss. Follow any responses to this post with its comments RSS feed. You can post a comment or trackback from your blog.